Remember how I said I was going to work my way through drafts and archives? This is one of those, written in the beginning of December 2013 then filed away (but certainly not forgotten) in favour of far too many Christmas dessert recipes, it happens. In any case, instead of changing it to suit late summer I’m leaving it as is, because I can. Stay tuned for all the sides too. Slightly arbitrary, perhaps, but let’s be honest — Mother Nature does whatever she likes, whenever she likes, regardless of what our calendars and retail sales cycles are currently promoting. Besides, we all know that contrary to what the rest of the world is raging on about, I do pretty much whatever I like too. So let’s talk barbeque. During our recent holiday we had the pleasure of experiencing sauce-up-to-your-elbows-smoke-in-your-hair proper Texas BBQ. It was the kind of barbeque where you queue at 10 am to wait for meat — cut to order and served by weight — that has been slow cooking for nearly a day. The kind were there is a live country rock band playing the time away, and help-yourself-Bloody-Marys in a cooler jug, and picnic tables sporting loaves of white bread and rolls of paper towel, and more y’all’s than a beauty pagent. The brisket was dripping with juice and knobbly with a pepper crust. The ribs fell off the bone. 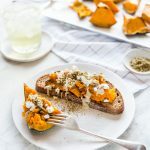 The baked squash was heavier with cheese and cream than squash (lest anyone risk delaying heart disease with a vegetable). The sauce was a stew of onions and pan drippings, just because it could be. Our visit to John Mueller Meat Co deserves a post on its own — and will get one some day — but this here is what happened a few weeks after we returned home when RJ looked at me with puppy-dog eyes and asked if I could make BBQ Brisket. A stop at the local butcher shop with a request for a cut of brisket saw the man behind the counter pop into the cool room and slice a couple kilos of meat off a beast hanging from the ceiling. A check of the fire warnings confirmed we could light up the Weber. A make-it-up-as-I-go recipe emerged slowly as did the smoke — lots of smoke — and a whole bunch of sides because BBQ isn’t BBQ without sauce, and beans, and cornbread to sop it all up. Because it’s summer and summer means barbeque. Y’all come back now ya’hear. 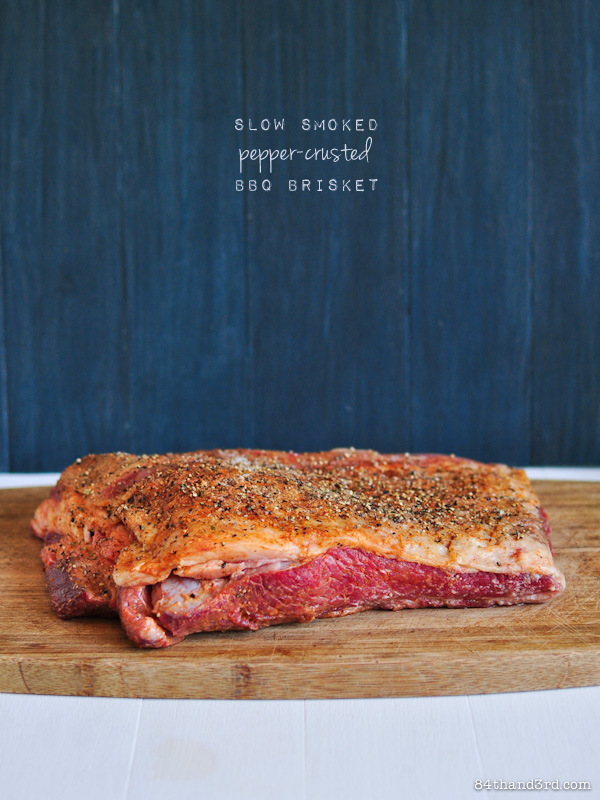 Proper barbeque cannot be rushed, ever, and there is nothing quite like proper slow cooked, smokey, peppery brisket. Nothing. Place wood chips in water to soak. Pile coals on one side of your grill and get them going so they have time to smoulder before you add in the brisket, it may take up to an hour. Place a disposable aluminum pan next to the coals under the rack where the meat will cook. 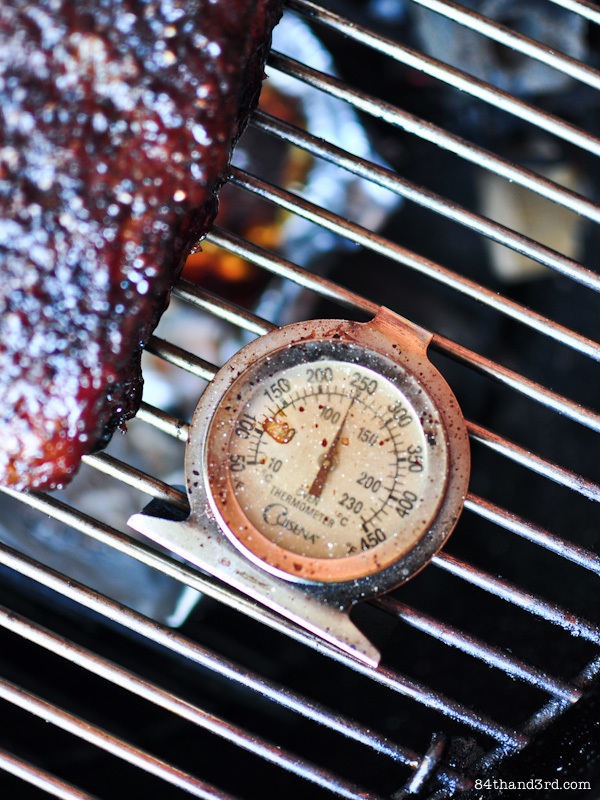 If you have an oven thermometer pop it on the rack on the opposite side from the coals. Rinse brisket with cool water and pat dry. Whisk mustard, vinegar and beer together, rub over all sides of meat and let sit 15 to 30 mins. Gently pat dry with paper towel then rub well on all sides with BBQ Spice Rub, followed by a generous amount of cracked black pepper (seriously, use more). Rub salt into top fat layer and place seasoned meat, fat side up, into a second disposable aluminum pan. When coals are ready place meat (in pan) on the centre of the rack — over the extra pan but not over the coals — so it is cooking with indirect heat. 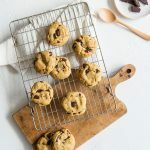 Place a few handfuls of wood chips onto a piece of aluminum foil and set on rack directly over the coals, drop a few chips onto the coals to start the smoke. Cover BBQ grill with the lid and open the vents on top and bottom. Monitor temp and adjust air regularly to regulate heat to 120°C (250°F). More air equals more heat, less air less heat, simple. Keep meat in the pan for the first two hours or so, then move it directly onto rack over the extra pan to catch drippings (still not over coals). Keep juices in the pan you just removed the meat from for your BBQ Sauce, then keep pan for when brisket is done cooking. Cook for a total of oh, 6 to 7 hours (1.5 hours per pound/half kilo of meat) keeping heat at 120°C (250°F) until it is nearly falling apart. Every now and then turn brisket — top to bottom, side to side — and drop a few more chips directly into the coals to create extra smoke. The brisket is done when fat is all melt-y; size has shrunk by about a third; the whole thing has a lovely crust; and the meat, when pinched with tongs, all but falls apart. Remove from grill, pop it back in the pan it started out in and rest for 30 mins. 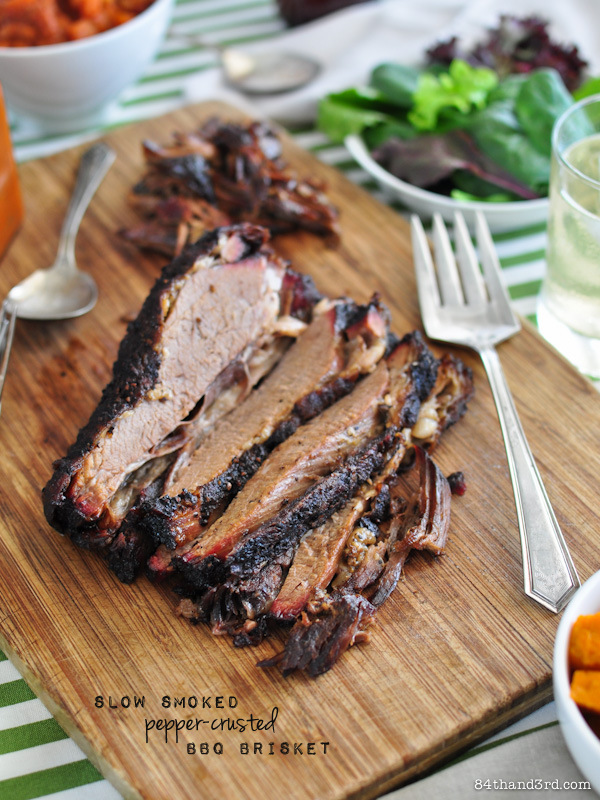 Use a non-serrated carving knife to cut brisket into thick slices against the grain. Serve with BBQ Sauce, BBQ Beans, Coconut Roasted Pumpkin (coming soon), Cornbread or Cornbread Waffles and a fresh salad. 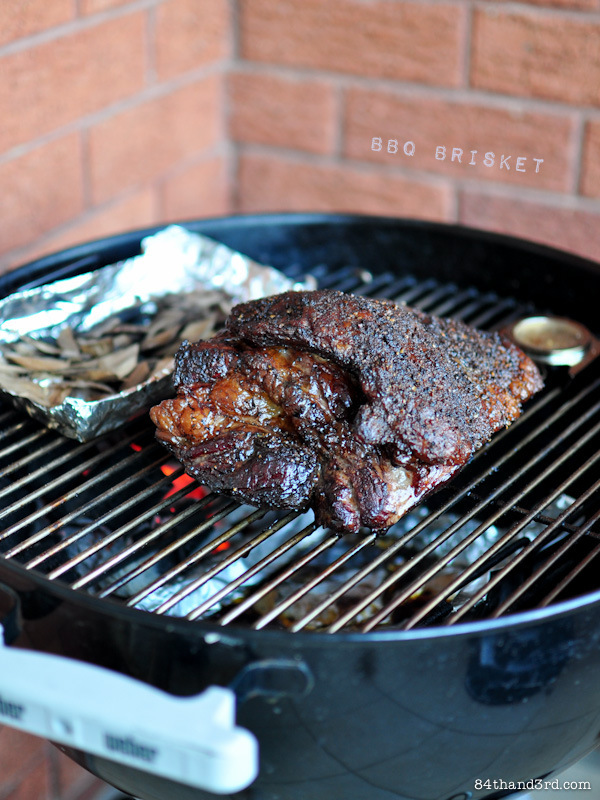 Slow smoked brisket using a Weber kettle bbq and burning real wood charcoal. You can’t slow-cook anything directly over coals or fire, it just won’t work. I set the coals into the side bottom section of my Weber, get them smouldering and cook the meat on top of the rack away from the coals. I put my oven thermometer on the bbq rack to keep an eye on the temp. You want it to be about 110° – 120°C (225° – 250°F). 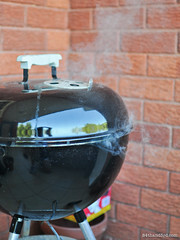 Control your heat with the air vents on the top of the lid and the bottom of the grill. More air equals more heat, less air less heat. With the vents all the way open I was running at about 180°C (350°F) which is way too hot. I took the lid off until the temp went down to 250°F, closed the vents slightly from where they were (less air equals less heat) and put the lid back on. Check again after 10 or 15 mins to see if the temp went back up or simply maintained itself. Repeat as necessary and check each time you turn the meat. I ended up with both vents half closed to keep the temp right. I started my brisket in a foil pan because I didn’t pay attention to the fact that most people cook directly on the rack. About 2 hours into cooking I moved the meat onto the rack, poured off the juices to save for later and placed the pan in the bottom of the grill to catch any drips for the remaining 4 – 5 hrs of cooking. Make your life easier by starting with an extra pan in the base of the BBQ so you don’t have to change anything when you place the meat on the rack. Best of both worlds plus lots of pan juices for sauce — so that’s what I put in the method above. 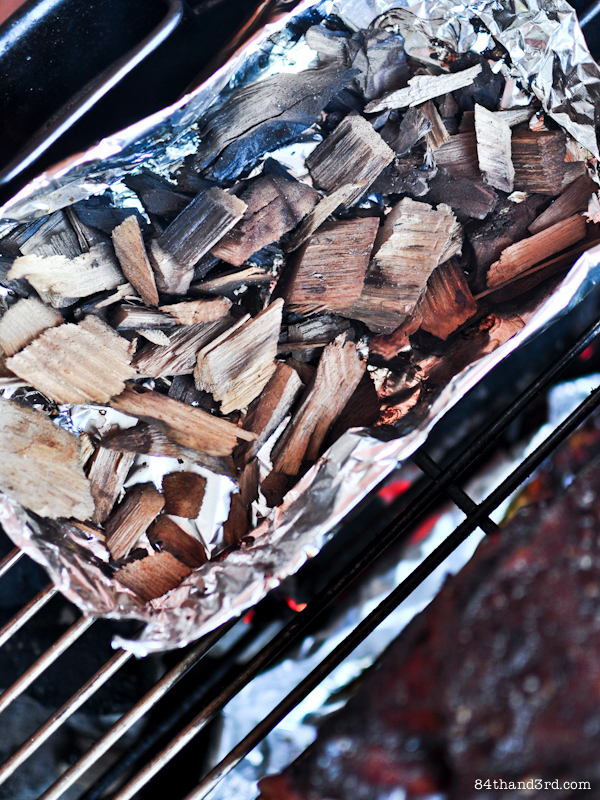 Soak your wood chips while your coals heat up. I started out by dropping a few soaked chips onto the hot coals to get the smoke going, then drain a couple handfuls and put them on a piece of foil directly over the coals. Every now and then to create a bit of extra smoke I dropped more chips directly into the coals. The neighbours probably hate me, it happens. As a side note, I’ve been a veg-aquarian for years and although I wasn’t consuming meat I have always cooked it. Recently I’ve been tasting meaty things, a bite here and there, because the texture somehow isn’t as offensive to me as it was 15 years ago or so when I stopped eating it. Just in case you were wondering. Oh and one of those aforementioned draft posts goes into much more details about all this … we’ll see if it ever sees the light of day. 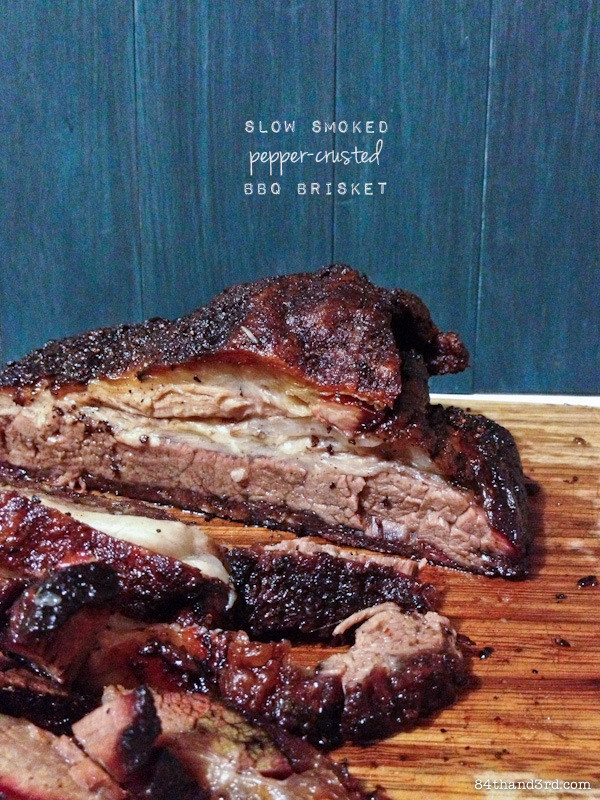 That pepper crust looks incredible, I can only imagine the torture of waiting for this brisket to come off the BBQ! oh my freaking god that brisket!!! i want it, i NEED IT! Whoa! My meat loving heart is going wild for this! Now that makes me want to go out and get the BBQ fired up right away. Awesome JJ. Bloody Mary’s in the cooler and awesome brisket- my kind of day. Looks amazing! I love a good brisket JJ! 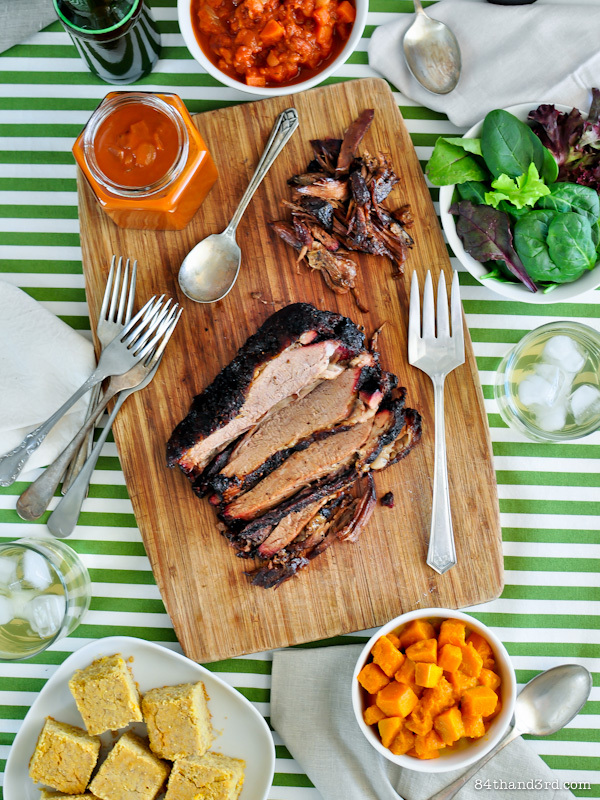 This looks heavenly…and thanks for all the tips (to use on my tiny bbq!). ive got a big pile up n my archives too, must get cracking! 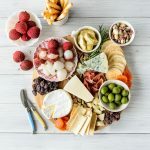 this looks fab, perfect for a summer bbq! Oh wow. JJ, this brisket looks absolutely amazing! Yum. 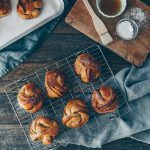 I am a huge fan of barbecued food, particularly on weekends, so I’ll be bookmarking this recipe to hopefully experiment with on Sunday. I feel lucky that we have a BBQ kettle now… smoke ahoy!! 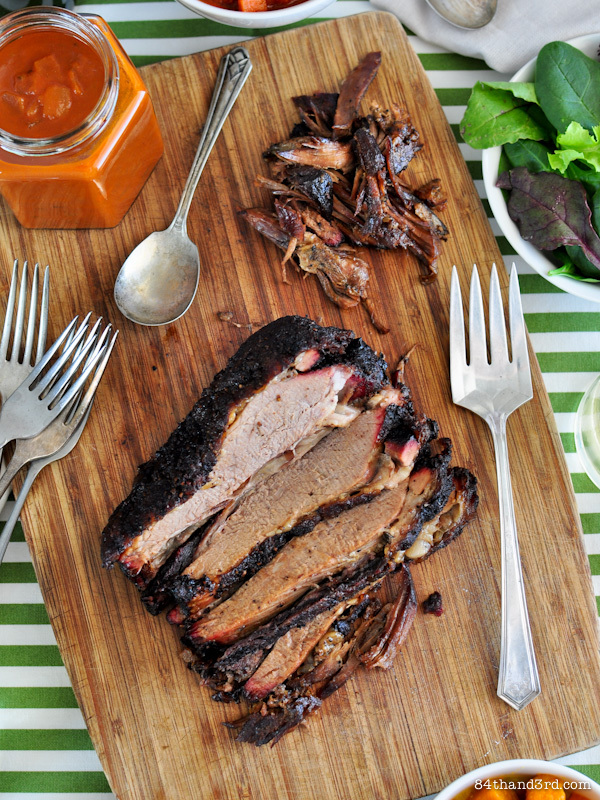 Whoa… your brisket looks fantastic! I love your tip on the bbq too. Very simple ingredient list, yet all the slow smoked bbq technique does the magic! Wow… The meat looks amazing!! I hear so much about brisket that I really want to try some now. I’ll have to come back to this post once I can source the cut in Perth. That really does look spectacular. I don’t often cook brisket (read never) but I often think I should.